How would you spend the £180m catalyst cash? 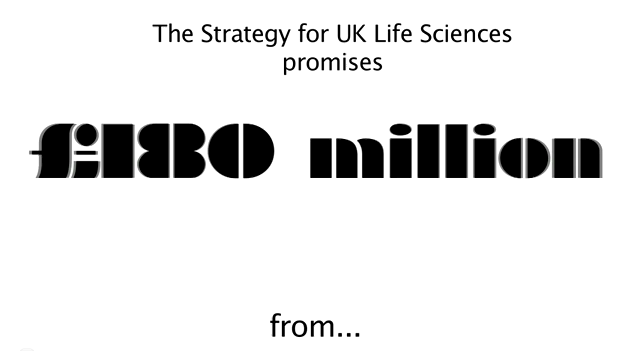 In December 2011, the UK government announced a new Strategy for the Life Sciences. The document pledged a £180 million catalyst fund to foster a better relationship between scientists in academia and industry experts who commercialise research. In this video, Purse String Theory spoke to a few people from the life sciences industry and academia to find out how they would spend the money to improve the partnership. Interviews were recorded at NESTA’s After the Life Sciences Strategy event. Sound clips thanks to kjackson and FreqMan. Nicely filmed video with good sound. The captions take up too much time at the start and the sound effect is also over-long (but a nice idea if done well – the freeze-frame works well). You need to keep the clips snappy and edit yourself out – brief the interviewee to include your question in their answer, or use a caption. Put the video first and the text after it – we don’t need to read the text to get straight into it.